He’d been on the job just two short weeks. Two weeks at the most prestigious publication in his industry, and he was already on the brink of bringing The Entire Machine to a halt. With a thud, not a screech. With a Wednesday article deadline looming, on Monday morning he had nothing but the few beads of sweat forming on his brow. Those were something at least, so he didn’t wipe them away. He procrastinated. He hopped from link to link, half-reading in between his worries … a mere 29 minutes from the conference call where he’d be asked by the top brass about the obviously gaping hole in this week’s schedule. Wednesday. Damn Wednesday. The most indispensable lesson he’d ever learned about persuasion would save the day. Stories about dying, mothers, and fighting for your ideas. Stories about snowboarding, subdural hematomas, and the secret of life. Hell, even made-up stories about CEOs on ether trips shooting social media darlings with elephant tranquilizers. They persuade in different ways and for different goals. But they persuade. And the storytelling doesn’t even have to be so blatant. To grab your audience’s attention, you don’t need to use the third person and narrate neurotic work worries you once had. (Though you can, like I did above.) You don’t need to reveal your deepest, darkest secrets. Those are the words of Cliff Atkinson, author and communications consultant, from an article in the Wall Street Journal. Yes, even a publication known for numbers and news knows that when it comes to persuasion, stories succeed. But not just any story. So, how do you tell a good story? Number 4 is where you come in. Weave yourself into your story as a wise mentor by demonstrating authority. Take your audience on a journey that solves their problems and satisfies their desires. You can do this by sharing with your audience how you overcame an issue they might be facing. You can do this by sharing special anecdotes from your own experiences that teach people universal lessons they feel warm and fuzzy learning and relearning, like this ode to a blue-collar genius. And you can share the stories of others, like the man who rescued the family furniture business with nothing but a book and a killer work ethic. That means understanding the worldview of who you are talking to, then framing your story in a way that makes it resonate with your audience, and finally delivering the story — and its message — in the best way possible. When you tell a good story, when you tell it better to an audience than anyone else, you earn the privilege of persuading them. Facts, figures, and PowerPoint presentations can’t do what a narrative can do. Narrative conveys. It relates. It distills. Most importantly, narrative promotes understanding and cultivates connection. As Dennis Nishi retells it in the WSJ, Smith spent three weeks assembling a PowerPoint presentation he was to give to Procter & Gamble CEO A.G. Lafley. But on the day of the presentation, Mr. Lafley never once looked at the slides. He just watched Smith speak. The CEO of a multinational corporation didn’t care about slides. He cared about stories. Which is why Mr. Smith now uses far more anecdotes in his presentations. Which is why Mr. Smith now has far more success selling his ideas. To develop your confidence, learn how to feel great naked. To develop your authority, learn the time-tested methods that work from the people you trust. And then the next time you inevitably get in a pinch … tell a story. Not your facts and figures. Not your ideas. But your facts, figures, and ideas woven into a story that connects, solves, and satisfies. After all these centuries, stories are still the most powerful way to persuade. It’s a lesson that rescued me. And it might one day make you a hero. Editor’s note: The original version of this post was published on November 13, 2013. Jerod Morris has been writing for Copyblogger since 2013. He is the founder of The Showrunner -- a podcast and community for podcasters. Next article: Are You Fascinating Enough to Be a Content Marketer? Lovely article Jerod. I am a regular reader of Copyblogger and I keeps recommending my friends to follow as well. Thank you Abinash. 🙂 Keep spreading the good word! We appreciate it. That is what writers do – we tell stories. And good writers tell good stories well. Thank you. You are 100% right that stories matter. I used to give a LOT of speeches, and a good anecdote was literally worth thousands of dollars to me, because it would be so memorable that it would sell more speeches. But I am not convinced that effective stories require five elements. If I tell you that Kodak’s orange film boxes were once so ever-present that it seemed unimaginable the company would ever be threatened, I do not need a hero to raise the question in your mind whether your firm might also one day declare bankruptcy. Bruce, here we may be running up against the subtle differences between anecdotes/examples and stories. A story will indeed have a hero who is transformed as the story progresses. An anecdote/example may not necessarily need a stated hero to be effective. It’s more of an implied hero. Ostensibly you are sharing the Kodak anecdote with other business owners who might feel bulletproof to remind them that if Kodak can go into bankruptcy that ANYONE can go into bankruptcy. You guys always get me to click through from the emails to your site. …thought leadership sells. Ultimately, it is going to be difficult for anybody to get an impact from their story if nobody knows who they are or why they should even care. A non regular reader of your post will think you are a poet. This is damn good, away from the technical languages of CSS, HTML, DNS e.t.c. This model can be inculcated into content marketing, it will sure help fire up a positive conversion and broader reach. Thank you Dare! It’s funny you mention that. The first writing I ever did — and to this day, the most enjoyable — was poetry. So I’ll take your comment as a massive compliment. Some of the greatest fiction writers that I know are poets. Poetry teaches you how to be masterful with words, since each line of prose has to speak for itself. It really does. You just have to be careful though, because poetry isn’t always about coming right out and saying what you mean. Good copywriting is, though. 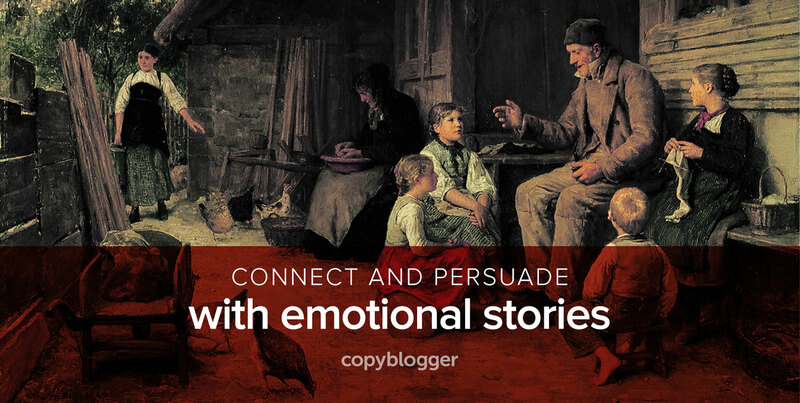 Another story from CopyBlogger that inspires! Thanks you guys for always putting out simple yet thought provoking ideas that just ring true. I have a meeting coming up with a CEO of a great non-profit here in Montana and I was wondering what I should do to prepare for it. I think I have found an answer here. That’s so great to hear JJ! Our goal with every post is to give our audience information and/or inspiration that they can take with them away from the computer screen and into their days. So happy to hear that this post did that for you. This is a great article. It’s nice to see some well-defined tips on persuasive writing. A true story is impactful. Truth is more powerful than a lie. Try spinning a movie to your audience and they might be lost for ever. Yep, always be truthful. Otherwise you will quickly lose credibility and authority. Great article, Jerod. As a long time Toastmaster, I can tell you that stories are the key to building rapport with an audience. Facts, figures and bullet point ridden Powerpoints do just the opposite. In fact, the best button in Powerpoint is the “B” key, which turns the screen black and returns the audience’s attention to you. Love it. Use the facts, figures, and bullet points to build credibility and add a layer of depth, but let the story sell the ideas. It’s an amazing experience when giving a Powerpoint to hit the B key. You’ll instantly see all eyes focus back on you. A perfect place to add an anecdote or story. I understand how you can weave a story into a live presentation; I see the point in sharing stories with the readers of my blog, but.. when it comes to writing a sales page, or web copy, where do the stories come in? How do they fit into the structure of addressing a problem & showing a solution? If I use a story “format”, don’t I face the risk of loosing lots of my mission oriented audience? The first thing I would ask you is how is an article or sales page different than a live presentation? They are more alike than different. They are all the presentation of information designed to elicit a response. Thing is, the purpose is indeed the same, but the platform is totally different.. Being a copywriter (& an occasional poet :), there’s nothing I would have loved more than coming up with a story, either real or invented. Structure wise, where does it come in (say, in a sales page)? As an appetizer, as main text conveying my whole marketing message? Can I trust the impatient reader to go through it, understanding upfront that it’s leading to a bottom-line relevant to him? Seems to me there’s something I’m missing here..
Sigal, all of those are important questions. That is why it’s not just telling a story that is important, but being good at telling good stories. There are no universal answers for where a story should go, how long it should be, etc. It depends on the medium and the audience. The value you bring as a copywriter and content marketer is knowing where a story fits best and HOW to tell it (in terms of tone and length) to achieve the desired result. As a former elementary teacher turned content marketer I am never surprised that the same ‘tactics’ great teachers use in capturing the attention and curiosity of young learners are basically the same tactics great content marketers employ. We humans grow older, but don’t change all that much. We still love stories- and stories that have depth and purpose. I love it! Thank you Vicky. 🙂 Indeed, when you are trying to connect with or persuade human beings, it’s imperative that you understand human nature. And humans respond to stories. Always have, always will. What you have quoted here is an Undeniable fact. When stories are retold to suit the current trend and presented in a spectacular fashion it is often remembered, cherished and sometimes may become irreplaceable. When you hear the word titanic I bet Kate Winslet and Leonardo DiCaprio will cross your mind for sure, ever heard of Robert Wagner and Audrey Dalton? They are from the good old Titanic (1953) movie. I bet Cameron and many others have already applied what you have said now and it’s time for us to start thinking in this direction. Hoping to become a hero soon 🙂 , Great Post Jerod, thanks for sharing. Hi Jerod – great article. I would add that a good story always involves the main character undergoing some kind of change – they’re never quite the same at the end of the story. I’m always surprised at how traditional storytelling strategies can be applied to blogging and Social Media posts. Thanks for sharing! Great post and great points! I really like the last sentence about maybe being a hero one day. I think all bloggers should focus on being a hero to their readers because people need a hero these days! I think part of a good story is leaving your audience with a big ‘Ah, ha.’ As a Park Ranger, and blogger, I use story to help visitors connect intellectually and emotionally. They are the heroes. Yes they are Gaelyn. Your audience is the hero. This is a great blueprint to follow in copy writing and story telling. It’s also why I think the “write one post every day” train of thinking goes against this method of story telling, simply because it takes time to write a story worth telling. Thanks for this blueprint, Jerod! Dan, you got it! And yes, only write one post every day if you can write one QUALITY post every day. Quality is more important than quantity. Great article. I’m always tweaking our website to connect with our visitors. I am going to follow your ideas. Wonderful article by Jerod. He has given a complete guideline to make up a emotional story. I heard from others that the best way to sell is to tell a story during your meeting. I am so glad, I read Jerod’s story. I know we live in a digital, paperless age, but would it be possible to add a print style sheet to the Copyblogger site? I often print your articles. Paper is much easier on the eyes and I enjoy highlighting and making notes on the paper. Unfortunately, the layout is a disaster when printed. A print version would be a great addition to the recent design changes at Copyblogger. This reminds me a lot of Jordan Belford’s book on persuasion. Interesting article, and i agree with a lot of the tactics mentioned here. I have had a talent for storytelling since I was just a little girl. This article opened my eyes to see that I need to be tapping into that gift even in my copywriting. Thanks! I really enjoy reading this article. I am a regular reader of every post of copyblogger. I just bookmarked it for future reference. Thank you for sharing with us Jerod. This is an excellent post that efficiently captures many key persuasion elements in a straightforward, easy-to-digest text. Well done! I’ve been fascinated with the art and science of persuasion since taking a class in grad school. I learned that many of the principles date back centuries, and Aristotle laid the groundwork in his treatise on “Rhetoric”. Despite the passage of time, it turns out that humans are still wired in much the same way , making us responsive to the same persuasive techniques in the digital age as we were in ancient times. Great writeup, thank you Jerod! I’m a digital marketer who sells my personal product online. Honestly, I have used story telling to sell huge numbers of items. A precise story telling will do nothing than to connect you and your audience emotionally. Thanks for this post. Excellent thoughtful article Mr. Morris. Thank you! Story telling is the most powerful way to convey a thought or message rather than traditional modes of convincing people. This article is amazing. I have found this to be very informative. I’m looking forward to read more of your work. A very good one here Jerod. I had to read this, close it and still come back to it. Personally i feel people get more engaged with articles wrapped with personal stories. It kinda builds rapport with the audience while giving some more details about the author. Folks love to know more about who they admire. I can list the benefits of what you just put up here on and on but, the good thing is; this article is really helpful. Thanks a lot. I’d rather not write at all than to write like this. I usually have the habit of reading only the articles and skipping comments, but here in copyblogger each and very comment is worth reading. Sometimes comments give out the things missed on a article which is worth your time. Thank you Jerod for a wonderful article and thank you fellow commenters! Lovely article Morris you are jewel my friend. I am a regular reader of Copyblogger and I always keep my friends in loop to follow these kind of engaging posts. Playing with people emotions always work well for business. Connect with your audience and make them feel special. Great Article! A moral story telling is a great way to engage audience to your blog. A good story will always work as a powerful tool to deliver your thoughts. Sometimes an incident or self-experience motivates you to publish a story. Your article made me realize that I don’t actually tell many stories. I think that I need to tell more and I will definitely be using your 5 elements (I have printed them out) as a framework for what needs to be included. I have also taken on board the comments about confidence and authority. Thanks for the article. Hi Jerod, storytelling is the goldmine for persuading people. So I think that every successful blogger needs to be a good storyteller.